The National League’s two best starting pitchers were masterful on Thursday afternoon, as St. Louis Cardinals ace Adam Wainwright outdueled New York Mets ace Matt Harvey in 2-1 victory for his 10th victory of the season, the first to reach double digits in victories in either league this season. For the fifth straight game, Wainwright pitched into the seventh inning, wherein he went seven scoreless on Thursday, surrendering just four hits and striking out six batters and walking two. One particular aspect of his game this season has been his superb control, in that Thursday was just the second game that Wainwright has surrendered two walks. Wainwright had walked just two batters in his previous 33 1/3 innings of work and currently holds onto a 97/7 strikeout to walk ratio in 103.0 innings of work this season. According to ESPN Stats and Information, Wainwright is on pace to produce the second highest strikeout to walk ratio since 1900. 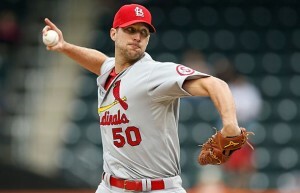 Prior to Thursday’s game, Wainwright was on pace to break the record. In 14 starts this season, Wainwright boasts a 10-3 record and 2.18 ERA. The Cardinals ace is the National League leader in wins (10), innings pitched (103.0), and complete games (3), and sits fourth in strikeouts (97) and ERA (2.18). After finishing third in CY Young Award voting in 2009 and runner-up to Roy Halladay in 2010, Wainwright has been pitching with similar, if not better efficiency this season, as we have witnessed the Cardinals ace pitch more effectively and dominantly with each passing start. For Wainwright, he once believed that his success was an extension of his abiding to a strict set of pre-game superstitions and rituals. The Cardinals ace also figured out how to regain his dominant form from 2009-2010 in the wake of Tommy John surgery and a mediocre 2012 somewhere along the way, as Wainwright has “re-cemented” his name atop the marquee of the league’s top starting pitchers this season.